Everyone involved in the plot to assassinate JFK knew just what they had to know in order to fulfill a role. The less each conspirator knew about the bigger picture the better. All they needed to do was to be told what to do and when to do it. Anything more than this was deemed unnecessary and dangerous. There is actually a well trodden term used for this policy called "plausible denial," a title that best selling author and civil rights attorney used for one of his shocking books. In Lane's coverage of the little reported libel trial brought by CIA operative E. Howard Hunt against Spotlight Magazine, Hunt says, "the principle of plausible denial is simply if an operation or action is later disclosed, for example, as an action by the United States government, the government can plausibly deny it, deny any involvement or connection with the action." Most Americans have no idea that the jury in Hunt v. Liberty Lobby found the magazine not guilty for libeling Hunt when they published a piece by another CIA agent who claimed Hunt was in Dallas on November 22, 1963 and helped to kill the president. Let me repeat that. A jury found the magazine not guilty of libel. The published accusation implicating Hunt was found to be truthful. No wonder that this sensational verdict was not publicized by the major news behemoths such as CBS, NBC, The New York Times, and the Washington Post. Plausible denial, after-all, can not work without the corporate news machine actively distorting reality by releasing false information and suppressing facts. Although Hunt may not have been a trigger man that afternoon, he served a logistical purpose. In his deathbed confession to his son (later sold to Rolling Stone Magazine), Hunt referred to himself as a "bench warmer" that day. It is doubtful that he knew what would happen to the plan if he aborted prematurely or acted in any other way that would compromise the event from succeeding. Hunt, like so many others involved in the plot, was told where exactly he needed to be. But he was told very little or nothing about what would happen next. As incomprehensible as it may be for some readers to accept, the doctrine of plausible denial extended all the way to Lyndon B. Johnson and J. Edgar Hoover. One important fact that the newly released JFK documents have shed light on, is the strange and suspicious behavior of the vice president and the director of the FBI. History has shown that both men had a great deal to gain from Kennedy's death and a whole lot to lose if he remained in power. Johnson was going to be dropped from the ticket in 64, and likely indicted for corruption related to his nefarious dealings in Texas and Congress. Hoover was going to be let go after the election because he could not cooperate with the president's attorney general brother. The hatred between the Kennedy brothers and LBJ and Hoover was known to everyone in Washington. Perhaps Johnson may have only caught wind of the plot and then willfully condoned it out of political self preservation and personal jealously. Likely, he was never told a single detail about the operation itself, for telling him anything which could potentially incriminate him later on would have been a careless violation. Nevertheless, as soon as Kennedy was shot, Johnson sprang into action like a pouncing tiger. According to the late investigative journalist Jim Marrs, "at Johnson's order the presidential limousine 5x-100, which carried Kennedy through Dallas, was shipped to Detroit where the body was replaced and the interior completely refurbished." As if this destruction of evidence was not bad enough, Marrs reported that, "After the assassination, Governor Connally's clothing-also vital evidence-was taken from the office of Congressman Henry Gonzales by Secret Service agents sent by Johnson aide Cliff Carter. Connally's clothing was cleaned and pressed by the time it was handed over to the Warren Commission and, hence, was useless for further study." Furthermore, Marrs was one of the first journalist to write about Johnson's swearing in alongside Jackie Kennedy. " After arriving back in Washington, Mrs. Kennedy explained to Robert Kennedy that the delay in returning was due to Johnson, who told her the attorney general had told him to take the oath of office in Dallas. Robert Kennedy was surprised and replied that he had made no such suggestion. Johnson compounded this lie months later in his deposition to the Warren Commission, when he again stated it was Attorney General Kennedy who had urged him to take the oath immediately." Johnson's real motive for requiring Jackie Kennedy's presence while he carried out the oath remains one of the most heavily guarded mysteries of the entire post- assassination cover up. Likewise, it appears that Hoover was complicit just enough to be useful but not informed enough to be culpable. He may not have been briefed in on the actual operation. Moreover, he may have never even spoken a single word to Oswald, who most JFK researchers believed was a CIA and FBI asset. But there is a wealth of circumstantial evidence which points to both a CIA and FBI link to Oswald, and the newly released files do nothing to euthanize this belief. Inexplicably, Hoover issued a memo on Nov. 24, 1963, the day Jack Ruby killed Lee Harvey Oswald, that stated, "There is nothing further on the Oswald case except that he is dead." What an astonishing thing for Hoover to dictate. The memo is one of at least 52 records never previously made public. How can Hoover say that there is nothing further on Oswald? How does Hoover know, just days after the assassination mind you, everything there is to know about the killer and his scheme? This is the most powerful investigatory branch of the federal government and it is tasked with solving the most important crime in American history. Yet just two days after a string of incredibly complex killings (i.e., JFK, Officer Tippit, and Oswald) the FBI director says case closed. That announcement was either a stupendous example of negligence or a decision to railroad the investigation.Of course, at the time, Hoover believed that the principle of plausible denial would protect him and his agency from public scrutiny and historical judgement. With all of that being said, I think more than anything else these documents are forcing Americans to reexamine their relationship to the true purpose of citizenship. I sometimes wonder what President Kennedy would have us do with all of this information? Just thinking about plausible denial, what would Kennedy say about allowing oneself to be used for a cause that is not fully known or understood? What would JFK say about participating in crimes that will never be solved because the politicians, investigators, judges and journalists are mostly criminals themselves? 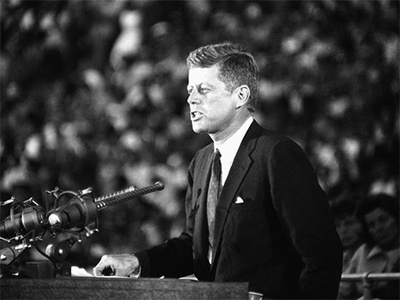 What would Kennedy say about our urge to justify extreme acts of violence in order to salvage a conservative peace? I think what can be learned from these new documents is that we have not learned all that much since Kennedy was shot dead by mercenaries inside his own government. Kennedy, if given the opportunity, would have all of us look inward and ask a simple yet cutting question: where in our own lives do we opt for the false security of plausible denial? And when do we choose to forfeit our rights as citizens because we are too afraid of the responsibility? George Cassidy Payne is a JFK researcher, domestic violence advocate, and adjunct professor of philosophy. He founded the online social justice organization Gandhi Earth Keepers International in 2014.